Adiponectin is an adipokine first described just over a decade ago. Produced almost exclusively by adipocytes, adiponectin circulates in high concentrations in human plasma. Research into this hormone has revealed it to have insulin-sensitizing, anti-inflammatory and cardioprotective roles. 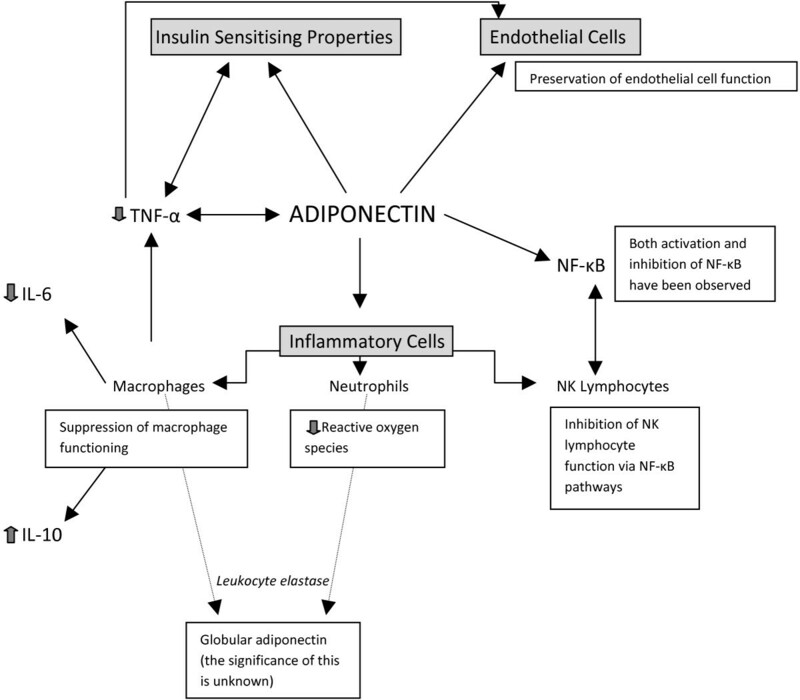 This review discusses the history, biology and physiological role of adiponectin and explores its role in disease, with specific focus on adiponectin in inflammation and sepsis. It appears that an inverse relationship exists between adiponectin and inflammatory cytokines. Low levels of adiponectin have been found in critically ill patients, although data are limited in human subjects at this stage. The role of adiponectin in systemic inflammation and critical illness is not well defined. Early data suggest that plasma levels of adiponectin are decreased in critical illness. Whether this is a result of the disease process itself or whether patients with lower levels of this hormone are more susceptible to developing a critical illness is not known. This observation of lower adiponectin levels then raises the possibility of therapeutic options to increase circulating adiponectin levels. The various options for modulation of serum adiponectin (recombinant adiponectin, thiazolidinediones) are discussed. It is now known that adipose tissue is a dynamic endocrine organ in its own right, secreting a number of biologically active proteins, also known as adipokines . One of these adipokines, adiponectin, has been recognised to play a major role in the pathogenesis of the metabolic syndrome. In recent years, its role in the modulation of inflammation has become increasingly apparent. There has therefore been a spate of research examining its role in critical illness and sepsis. In this review we will discuss the biology of adiponectin and its physiological role, with a predominant emphasis on its role in inflammation and critical illness. The source of adipokines is either the adipocytes themselves or the stromal vascular fraction within adipose tissue, comprising preadipocytes, endothelial cells, fibroblasts, leukocytes and macrophages . Resident stromal macrophages are a source of IL-10 and arginase. However, 'classically activated' macrophages recruited from the circulation to obese adipose tissue secrete the pro-inflammatory cytokines TNF-α, inducible nitric oxide synthase, and IL-6. Adipocytes are responsible for the production of adiponectin, leptin, angiotensinogen and retinol-binding protein. Some adipokines, including monocyte chemoattractant protein-1 and apelin, are produced by both fractions [1, 2]. Adiponectin is a protein produced and secreted almost exclusively by adipocytes . First described over a decade ago, the interest in the biology of adiponectin was spurred by the discovery of measurable concentrations in plasma, its structural resemblance to complement factor C1q and the consistent finding of decreased levels in obesity . Adiponectin circulates in high concentrations in healthy adults and mice, accounting for 0.01% of total plasma protein and its plasma levels are a thousand times that of leptin . Circulating levels of adiponectin range between 2 and 30 μg/ml in humans [4, 6] and are generally higher in females than males . This sexual dimorphism has been attributed to the effect of testosterone on adiponectin secretion . The gene encoding human adiponectin has been mapped to chromosome 3q27 . 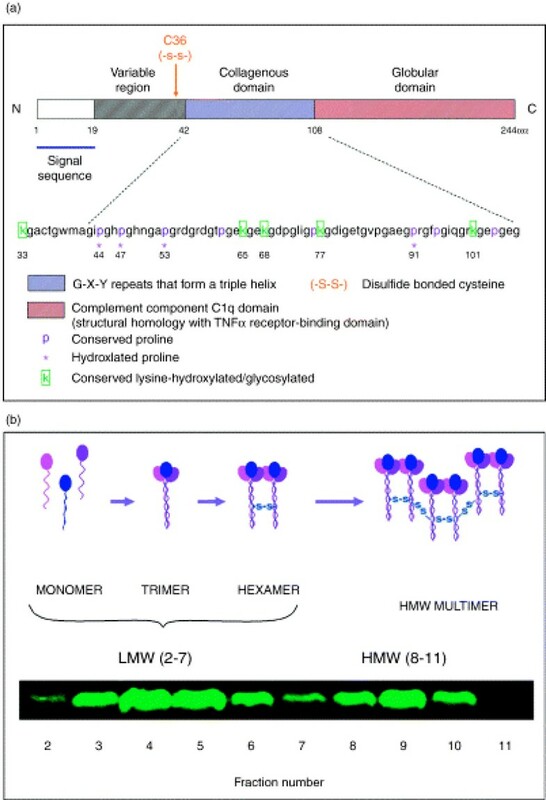 In serum, adiponectin exists as three main forms: trimers, hexamers and high-molecular weight (HMW) multimers. To create these forms, a number of post-translational modifications are required (Figure 1). The structure and multimerization of adiponectin. (a) The domain structure of human adiponectin. (b) Adiponectin multimerization and analysis by velocity sedimentation. Separation of low-molecular weight (LMW) and high-molecular weight (HMW) multimers was performed by centrifugation on a 5 to 20% sucrose density gradient. Fractions 2 to 7 of the gradient contain the LMW multimers, while the HMW multimers are found in fractions 8 to 11. Reproduced from Whitehead JP and colleagues . This complex process and the cellular machinery involved in the secretion of adiponectin from adipocytes are well-described in several excellent reviews [10, 11]. Murine studies show the half-life of circulating adiponectin to be 75 minutes with clearance mediated by the liver. HMW adiponectin has the slowest plasma clearance rate and serum levels remain fairly constant, despite rapid turnover . There is evidence of elevated levels of adiponectin in chronic kidney disease and reduced clearance rates have been observed in animal models of end-stage renal disease . A reduction in serum adiponectin has been observed after renal transplantation in humans, suggesting a possible role for the kidney in adiponectin clearance . Three adiponectin receptors, AdipoR1, AdipoR2 and T-cadherin, have been identified. AdipoR1 is ubiquitous, but is most abundantly expressed in skeletal muscle and is linked to activation of AMP-activated kinase (AMPK) pathways. AdipoR2 is most abundantly expressed in the liver and is associated with activation of peroxisome proliferator-activated receptor (PPAR)-α pathways [15, 16]. A third receptor for adiponectin, T-cadherin, expressed on vascular endothelial cells and smooth muscle, is a receptor for hexameric and HMW adiponectin . The activation of AdipoR1 and R2 results in increased hepatic and skeletal muscle fatty acid oxidation, increased skeletal muscle lactate production, reduced hepatic gluconeogenesis, increased cellular glucose uptake and inhibition of inflammation and oxidative stress [18, 19]. Activation of T-cadherin is protective in vascular endothelial cells against oxidative stress-induced apoptosis  and is strongly expressed in regions of atherosclerosis . The precise physiological role of adiponectin is unclear. Adiponectin does not seem to be essential for survival as knockout (KO) mice survive with minimal lethality . In humans, adiponectin is an insulin-sensitizing, vascular-protective, anti-inflammatory protein [4, 23, 24] associated with a more favourable lipoprotein subclass profile . To date, most of our understanding of adiponectin has been in its association with metabolic and cardiovascular health. Hypoadiponectinaemia is associated with obesity, insulin resistance and type 2 diabetes [4, 23, 24], as well as atherosclerosis, hypertension and coronary artery disease . Low circulating levels, particularly of the HMW component , are also a strong risk marker for the development of the metabolic syndrome and type 2 diabetes [27, 28] (Table 1). CRP, C-reactive protein; VLDL, very-low-density lipoprotein. Recently, several observations point to a potential role for adiponectin in a variety of inflammatory diseases. Elevated serum adiponectin levels have been found in association with systemic lupus erythematosus , cystic fibrosis , inflammatory bowel disease  and rheumatoid arthritis . The significance of these findings is not yet understood. Whether the high adiponectin may be part of the protective response to the underlying inflammation, or those with low adiponectin (or those less able to increase adiponectin) may be more prone to inflammation, or the changes purely represent an epiphenomenon need further elucidation. In this context, its role in the inflammatory response of critical illness is further discussed below. Adiponectin exerts an anti-inflammatory effect through activation of all three receptors. Several mechanisms have been suggested, including direct actions on inflammatory cells, actions on NF-κB, and interaction with TNF-α. Peripheral blood mononuclear cells (monocytes, natural killer (NK) cells and T and B lymphocytes) express adiponectin receptors 1 and 2 . Adiponectin inhibits the growth of myelomonocytic progenitors and the functioning of mature macrophages , suppresses macrophage-to-foam cell transformation , stimulates macrophage production of the anti-inflammatory cytokine IL-10 , inhibits both TNF-α-induced monocyte adhesion and adhesion molecule (vascular cell adhesion molecule (VCAM)-1, E-selection and intercellular adhesion molecule (ICAM)-1) surface expression on endothelial cells  and inhibits Toll-like receptor-mediated NF-κB activation in macrophages . Adiponectin also inhibits the production of reactive oxygen species in human neutrophils . Though of unclear significance, leukocyte elastase produced by neutrophils and activated monocytes is able to cleave adiponectin, producing a fragment containing the globular domain of the adiponectin molecule . Most of these data have been generated from bench studies and clear dose-response relationships have not been demonstrated. For example, Yokota and colleagues  used in vitro concentrations of 0 to 50 mcg/ml of adiponectin, which approximate circulating physiological concentrations. However, Magalang and colleagues  were able to demonstrate suppression of free radical formation at doses of 0.001 to 1 mcg/ml, which are clearly well below the normal concentrations. NF-κB, a key player in the inflammatory response, is involved in the regulation of cellular functions, including the stress response. The action of adiponectin on NF-κB pathways is complex, being both stimulatory and inhibitory. Initially, higher order multimers of adiponectin were reported to activate NF-κB pathways in myocytes . Activation of NF-κB pathways by adiponectin has also been observed in vascular endothelial cells  and fibroblasts , as well as hepatocytes , where NF-κB activation induces secretion of a protective chemokine. Counteracting the above evidence is the demonstration of an inhibitory effect of adiponectin on the NF-κB pathways. Adiponectin suppresses lipopolysaccharidase (LPS)-induced NF-κB activation in adipocytes , suppresses TNF-α-induced NF-κB pathways in endothelial cells  and inhibits NF-κB pathways in macrophages . Adiponectin is also able to regulate the cytotoxicity of NK cells. Adiponectin activates AMP-activated kinase pathways in NK cells, which, in turn, inhibit IL-2-induced NF-κB activation. This results in the suppression of the IL-2-enhanced cytotoxic activity of NK cells without affecting basal NK cell cytotoxicity . The importance of the dual nature of adiponectin effects on NF-κB is not clearly understood and raises questions about the timing and the significance of each of these effects. When it is stimulatory, what initiates the change to an inhibitory effect, and which signalling molecules trigger the change are not precisely understood . The inverse correlation demonstrated between adiponectin and TNF-α in cell cultures has not been consistently reproduced in human subjects. Keller and colleagues  induced endotoxaemia in 23 healthy humans. Following endotoxin injection, TNF-α and IL-6 levels increased; however, there was no significant change in the level of adiponectin. Anderson and colleagues  explored the relationship between acute inflammation and adipokines within a cohort of 20 healthy humans. Endotoxaemia was associated with increases in whole blood leukocyte, monocyte and adipose tissue TNF-α and IL-6 but with no significant changes in total plasma adiponectin or complex distribution. AdipoR1 and R2 receptor downregulation, however, was evident. Although adiponectin levels did not change, the downregulation of adiponectin receptors following endotoxaemia suggested attenuation of adiponectin's insulin sensitising and inflammatory signalling functions . In animal models of sepsis, adiponectin deficiency is associated with a marked increase in inflammatory mediator status and exacerbation of hepatic injury [56, 57]. In a recent study of 33 patients with severe sepsis or septic shock, a similar inverse correlation was demonstrated . This consistent finding raises the possibility that modulation of adiponectin in sepsis may be a potential therapeutic target to attenuate the inflammatory response. The anti-inflammatory properties of adiponectin are summarised in Figure 2. The anti-inflammatory actions of adiponectin. NK, natural killer. The early observations that adiponectin antagonises the inflammatory effects of TNF-α, negatively correlates with plasma TNF-α levels and shows structural homology to complement factor C1q led researchers to further investigate the relationship between adiponectin and sepsis. Both animal and human data have been reported. In rats with induced polymicrobial sepsis, plasma adiponectin levels negatively correlated with plasma endotoxin and TNF-α levels . Adiponectin was found to directly bind LPS and suppress limulus amoebocyte lysate in vitro. This animal model also provided the first evidence that the two adipokines, adiponectin and TNF-α, inversely regulate each other's circulating concentration. Uji and colleagues  reported that adiponectin KO mice were more susceptible to polymicrobial sepsis than wild-type mice. They investigated the role of adiponectin in sepsis using a murine model of caecal ligation and perforation (CLP). Adiponectin KO and wild-type mice were subjected to CLP and the effects of rosiglitazone (a PPAR-γ agonist) on survival were investigated. Although the authors concluded that adiponectin deficiency was associated with excess mortality and high cytokine levels, several questions were raised by the study. Plasma endotoxin and IL-6 levels in adiponectin KO mice after CLP were significantly higher than in wild-type mice only at 24 hours, not earlier. Moreover, other pharmacodynamic effects of adiponectin were not evident. There were no differences in glucose concentrations or high-density lipoprotein cholesterol levels between the two groups. Rosiglitazone improved mortality only in the wild-type mice, not KO mice, and cytokine levels were not presented in this subgroup. It is likely, therefore, that the beneficial effects of adiponectin on mortality may operate through pathways other than its anti-inflammatory effects. Not all studies support an anti-inflammatory role for adiponectin. A significant reduction in survival of adiponectin-gene deficient mice was found following CLP, as well as a greater influx of peritoneal neutrophils in these mice following thioglycollate-induced peritonitis . However, the administration of recombinant trimeric adiponectin did not significantly attenuate VCAM and ICAM expression in thioglycollate-challenged adiponectin KO mice, thus raising questions about its anti-inflammatory beneficial role . The improved survival in wild-type mice in this study compared to the KO mice raises the possibility that adiponectin may provide a survival benefit through alternative, as yet unknown mechanisms. Another study arguing against an anti-inflammatory role for adiponectin in sepsis is that of Pini and colleagues . They failed to find a difference in the inflammatory response generated by high-dose LPS or concanavalin A administration in adiponectin KO mice compared with wild type. This lack of positive findings was suggested to be due to the particular strain of adiponectin KO mice used in the study. A murine study investigating the role of adipokines in mice exposed to zymosan, a cell wall product of yeast, showed a significant decrease in serum adiponectin during zymosan-induced peritonitis in wild-type mice. The role of adiponectin in the inflammatory process did not appear significant, however, with adiponectin KO mice actually demonstrating a minor reduction in their peritoneal inflammatory cell infiltrate, and no significant changes in circulating cytokine levels when compared to wild-type mice . The data from animal trials are summarised in Table 2. CLP, caecal ligation and perforation; KO, knockout; LPS, lipopolysaccharidase; MCP-1, monocyte chemoattractant protein-1; PPAR, peroxisome proliferator-activated receptor. Limited human studies of adiponectin in critical illness exist. Lower levels of adiponectin have been found in critically ill patients [58, 63–65]. Additionally, Venkatesh and colleagues  described a strong association between plasma cortisol and adiponectin, an inverse correlation between plasma C-reactive protein and adiponectin, as well as a linear response between sickness severity and plasma adiponectin. Levels of C-reactive protein in plasma and adipose tissue negatively correlate with adiponectin [64, 66, 67]. A recent study of patients with acute respiratory failure showed that increased plasma adiponectin levels measured within 48 hours of respiratory failure are associated with mortality . In a study of paediatric patients with sepsis, increased levels of HMW adiponectin were found in the septic shock cohort on day 1 and the plasma levels correlated with risk of mortality scores. This was associated with an increase in PPAR-γ activity in peripheral blood mononuclear cells . The human data are summarised in Table 3. CRP, C-reactive protein; HMW, high-molecular weight; LAL, limulus amoebocyte lysate; LPS, lipopolysaccharidase; SIRS, systemic inflammatory response syndrome; SOFA, Sequential Organ Failure Assessment. Given the abundance of data supporting the beneficial role of adiponectin as a modulator of inflammation, the question arises whether this will play a role in critical illness. Several lines of evidence point to this. Firstly, serum adiponectin concentrations are inversely associated with the degree of inflammatory response in both cardiovascular disease and critical illness [59, 70]. Secondly, a number of studies have reported low levels of adiponectin in critical illness . Hypoadiponectinaemia is also associated with impaired endothelium-dependent vasorelaxation . Data in patients with viral infections and human experimental endotoxaemia suggest altered release patterns of adiponectin in these states [54, 72]. The biochemical features of critical illness, that is, hyperglycaemia and cytokinaemia, are also biomarkers for hypoadiponectinaemia. Finally, the increasing numbers of patients with an elevated body mass index and obesity being admitted to intensive care units also raises the prospect of adiponectin playing a role in their underlying pathophysiology. Based on the above set of hypotheses, one could advance the argument that modulation of adiponectin in critical illness may lead to improved inflammatory response, improved glucose tolerance and reduced vasopressor requirement. It therefore leads to the next question of whether adiponectin levels can be modulated. Despite recombinant adiponectin being widely used in the research setting, there are factors that make the production and therapeutic administration of adiponectin challenging. Full-length adiponectin is a complex molecule that undergoes significant posttranslational modifications, circulates in very high concentrations and has a short plasma half-life . An alternative option is the development of therapeutic agents that modulate and enhance expression and secretion of adiponectin from human cells . Thiazolidinediones are high-affinity ligands for PPAR-γ  and have strong insulin-sensitising effects . They enhance the expression of adiponectin mRNA within adipocytes  and increase the plasma concentration of adiponectin, with a specific increase in the HMW component . It has recently been shown that thiazolidinediones may result in increased secretion of HMW adiponectin from adipocytes, producing the elevated circulating levels . Treatment with fenofibrate results in an increase in serum HMW adiponectin , as does niacin therapy , despite neither therapies showing an improvement in insulin sensitivity. Another possibility to modulate levels would be to manipulate the clearance of adiponectin. Adiponectin is ultimately cleared by the liver, but little else is understood about clearance mechanisms . The method of clearance may differ between each molecular weight isoform. Large amounts of adiponectin are continually produced, but it has a relatively short half-life, suggesting that clearance pathways must play a very significant role in controlling circulating levels. Adiponectin is a newly described hormone that has a wide range of physiological and metabolic effects. It also appears to be cardioprotective and involved in modulating the inflammatory response. Its role in systemic inflammation and critical illness is not well-defined and warrants further investigation. Several questions remain. In critical illness, is survival influenced by baseline adiponectin levels, and would the ability to increase adiponectin and/or the HMW component via either altered expression, altered secretion from the fat cell or altered clearance confer prognostic significance? These questions will need to be examined in future studies. Adiponectin is an adipokine with insulin-sensitising and vascular-protective properties. Adiponectin also has anti-inflammatory properties. Preliminary data suggest low levels of adiponectin in critical illness. The significance of these observations needs further elucidation. The various therapeutic options to raise circulating levels are discussed. KR was responsible for manuscript preparation and drafting and revision of the manuscript. JP aided in the drafting of the manuscript. BV conceived of the manuscript and aided in the drafting and design of the manuscript. All authors read and approved the final manuscript.